Aquaclean natural pond cleaner is formulated for use in controlling pond scum, algae and odour that commonly plague lakes and ponds. Aquaclean works in the entire water column as well as the bottom sludge layers. Aquaclean is environmentally safe and is not harmful to fish, humans, plants and animals. Aquaclean is easy to use. Simply apply at regular intervals or as required during the algae season. Aquaclean is NOT an algaecide and no applicator's permit or license is necessary. DOSING GUIDE. First, calculate the maintenance dose. For every 5,000 Litres, this should be 4-8 grams per week depending on the accumulation of algae and organic matter. For example, a 3,000-Litre pond will require a maintenance dose of between 2.4 and 4.8 grams depending on how dirty the water is. In the first week dose three times the calculated maintenance dose as calculated above. In the second week, dose two times the maintenance dose. Thereafter dose with the maintenance rate for the rest of the season - usually March to October. Highly effective natural algae treatment. Removes blanket weed and blue-green algae. Don't forget that as the temperature rises during the days of spring and summer that algae and blanket weed grow faster. The best selling natural pond algae control. See why our customers with algae problems return every year and have no more algae problems. Don't forget, anyone can use Aquaclean; no chemicals and no operator's licence or permit required. 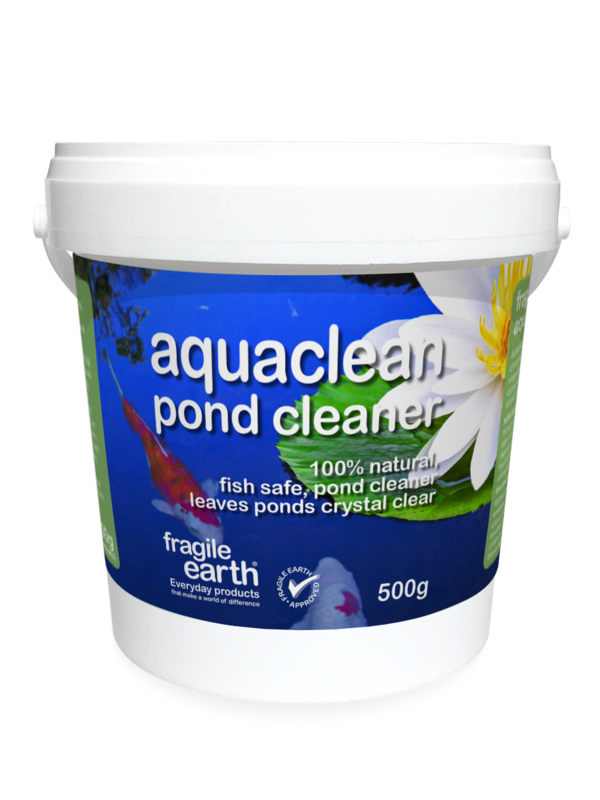 Fragile Earth Aquaclean (fish safe pond cleaner). Highly effective natural algae treatment. Remove Blanket Weed and blue-green algae. 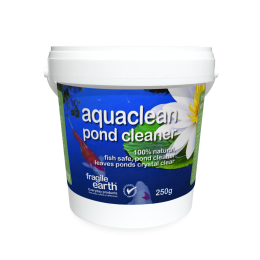 Fragile Earth Aquaclean natural pond cleaner is formulated for use in controlling pond scum, algae and odour that commonly plague lakes and ponds. Aquaclean works in the entire water column as well as the bottom sludge layers. Aquaclean is environmentally safe and is not harmful to humans, plants or animals. Aquaclean is easy to use. Simply apply at regular intervals or as required during the algae season. Aquaclean is NOT an algaecide and no applicator's permit or license is necessary. When does algal growth occur? Algal growth occurs when nitrates and nitrites become present in water, which is the food source for algae. When high levels of these exist, coupled with direct sunlight, all types of algae and blanket weed will bloom. The warmer the water is, the faster the algae and blanket weed will grow. AQUACLEAN works by removing this food source for algae, causing it to die away and also helping to prevent new algae growth. What do the bacteria in Aquaclean do? Remove blanketweed and blue-green algae. Break down organic and faecal waste in the water. Clarify lake or pond water. Eliminate ammonia and organic odours. Enhance the uptake of nutrients by grasses. Improve the aquatic environment for fish and wildlife. Reduce ammonia salts and other contaminants. Safe for humans, animals, fish and aquatic plant life. Control surface algae and blanketweed. When Fragile Earth Aquaclean natural pond cleaner is applied to the water phase algae blooms are controlled through competition. Aquaclean removes nitrogen compounds from the water column faster than the algae and as a result, the algae are starved out of existence and the bloom is inhibited. In addition, Aquaclean degrades accumulated organic waste, top scum and bottom sludge for use as carbon sources. The overall result is clean, clear water, free from algae, odours and sludge. Fragile Earth Aquaclean natural pond cleaner’s effective biological also eliminates ammonia and H2S and prevents the development of problematic odours and tainting of the water. Aquaclean is designed to treat the cause and not the effect. STEP 2 Calculate the maintenance dose. For every 5,000 litres, this should be 4-8 grams per week depending on the accumulation of algae and organic matter. For example, a 3,000-litre pond could require between a dose of between 24 and 28 grams depending on how dirty the water is. Note: A teaspoon is approximately 4 grams. STEP 3 In the first-week dose three times the calculated maintenance dose as calculated in STEP2. In the second week, dose two times the maintenance dose. Thereafter dose with the maintenance rate for the rest of the season - usually March to October. STORAGE & HANDLING: Store in a cool dry place. Avoid contact with skin. Thoroughly wash hands after use.